By the second half of the 19th Century, Blackwell’s Island housed many of the city’s charitable institutions; among them the Smallpox Hospital, the Lunatic Asylum and the poorhouse – diplomatically referred to as the Almshouse. The Almshouse originally consisted of two buildings, but by the 1880s there were at least a dozen structures making up the complex. Most of the institutions had their own chapels built into the structures as part of the architectural plan. But in 1872 when the Episcopal Church appointed William French as chaplain of Blackwell’s Island, the inmates of the Almshouse had no place to worship, being refused the use of other chapels. George M. Bliss intended to correct the situation. A banker, Bliss had amassed a fortune during the Civil War. A partner with Levi Morton, later to become Vice President of the United State, in the firm Morton, Bliss & Company, he was also the Treasurer of the Protestant Episcopal Mission Society. 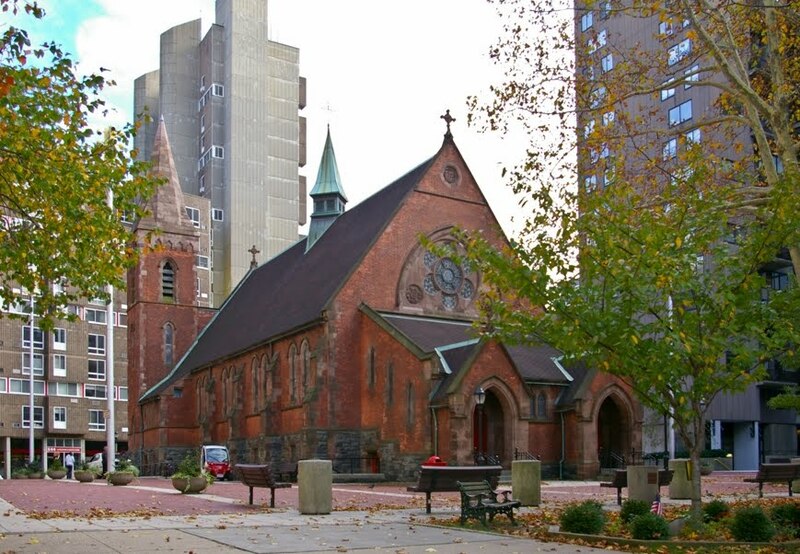 On February 9, 1889, the steamboat ferry from Manhattan carried Vice-President elect Morton, former mayor Hewitt, Bishop Potter, George Bliss and other dignitaries to Blackwell’s Island for the dedication of The Chapel of the Good Shepherd. As in his Jefferson Market Courthouse in Greenwich Village, Withers combined colors and textures for a pleasing effect. The red Flemish bond brick is dotted with occasional gray bricks. Brownstone trims contrast with the brick and the course gray gneiss, quarried on the island by inmates, of the lowest level. Separation of male and female worshippers was provided by two distinctive porches that lead to staircases accessing separate seating areas in the nave. By the end of the following year over 2000 visitors had taken the steam ferry from Manhattan to see the little chapel. Every Spring when the Episcopal Bishop of New York visited The Chapel of the Good Shepherd to administer the rite of confirmation to the poor, the newspapers vividly covered the event, describing in detail the plight of the impoverished. In 1892 The Times reported on the visit, which was attended by the Earl and Countess of Meath, Ireland. The Bishop’s annual confirmation visits continued until the middle of the 20th Century. Eventually, the buildings and institutions on the island became obsolete. More modern facilities in Queens and elsewhere were built and the old stone structures were abandoned and neglected. 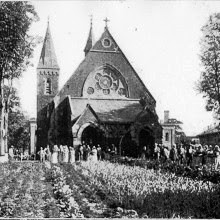 The Chapel of the Good Shepherd celebrated its last religious service in 1952. The chapel was saved by the erection of two long-term care facilities, Goldwater Hospital and Coler Hospital. The Chapel of the Good Shepherd was used as a home for the chaplain of Coler Hospital. By the 1970s the island, now named Roosevelt Island, had become a planned community of mixed income housing. The Chapel, now owned by the Roosevelt Island Operating Corporation, was included in a survey of potentially historically important structures, spearheaded by the Landmarks Preservation Commission. Restoration architect Giorgio Cavaglieri oversaw the first restoration of the chapel, which was completed in October of 1975. Twenty-two years later, based on a survey by architectural conservator William J. Stivale who identified several areas of disrepair, State Assembly Representative Pete Grannis began the allocation of a series of state grants for subsequent restoration. Headed by The New York Landmarks Conservancy with restoration contractors Schtiller & Plevy, work began in 2003. The masonry and brownstone trim of the bell tower and spire were cleaned, repaired and repointed. At some point in the mid-20th Century a sealant had been applied to the brownstone which trapped moisture in the stone, causing the outer layer to eventually begin falling away, a process termed delamination. These areas were re-tooled and patched with composite. 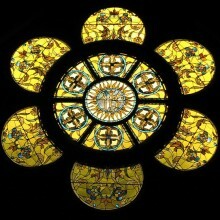 The topmost six feet of the spire was taken apart and rebuilt and the beautiful rose window was dismantled, releaded and replaced. 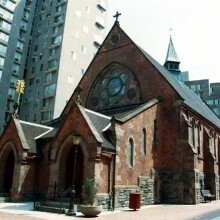 The chapel is once again a place of worship for both the Roman Catholic and Episcopal congregations of the island and doubles as the Roosevelt Island Community Center. Appropriately, the picturesque country church that was built for the poor now has a homeless shelter in the lower level.